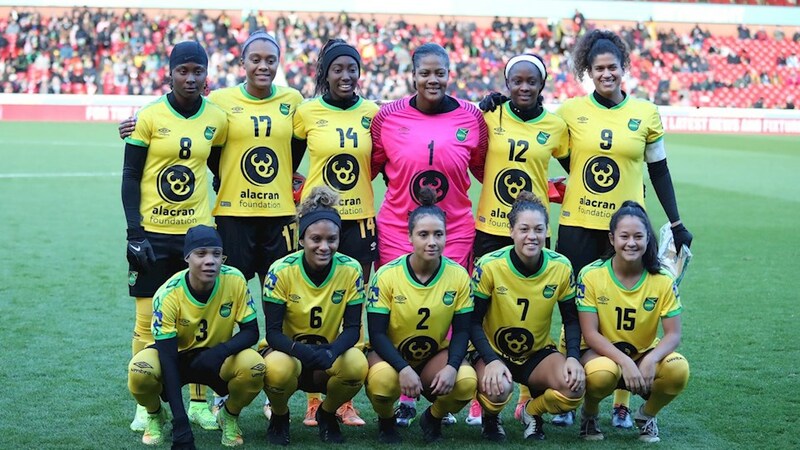 October 29 – Jamaica’s Reggae Girlz attracted the biggest crowd for a women’s game in Europe at the weekend with 3,914 watching the World Cup qualifiers play Nottingham Forest Ladies at The City Ground. Earlier this month the Jamaicans qualified for the Women’s World Cup for first time in their history, becoming the first Caribbean nation to book a ticket to world finals. The Reggae Girlz beat Panama 4-2 on penalities after an extra time 2-2 draw in the match for third place at the CONCACAF Women’s Championship, the region’s qualifying tournament for France 2019. Famously supported by Cedella Marley, the Jamaicans are breaking new ground for the country and the women’s game with their commitment and infectious enthusiasm. The trip to Nottingham was organised to celebrate the Windrush generation, who arrived in the UK 70 years ago. Dignitaries at the game included Jamaica’s High Commissioner, Seth George Ramocan, and Jamaica’s Minister of Foreign Affairs and Foreign Trade, Kamina Johnson-Smith, while reggae legend Freddie McGregor played some of his classic hits and sang the Jamaican national anthem before the match. The Reggae Girlz ran out 3-0 winners on the day that saw a variety of cultural activities embracing Nottingham’s Jamaican diaspora. But it is the positive impression the Reggae Girlz left on Nottingham rather than the result that will be remembered, and the talk of future collaboration.